There are three words every Apple fan loves to hear. They are three little words, words packed with promise, anticipation, and excitement. Those words are, of course, "one more thing". We didn't hear them at the iPhone 5 launch. This year, the only surprise was that Apple had finally chosen a musical guest that wasn't rubbish. Every other detail, from the size of the screen to the name of the new connector, had been leaked, analysed and discussed to death. 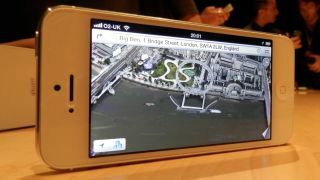 The leaks even told us that, as we predicted, the iPhone 5's 4G would only work on Everything Everywhere's network - although it missed the detail that that appears to be a permanent arrangement rather than a temporary one. The result of all the leaks is that Tim Cook could have taken the stage in front of a slide saying "What the internet said. Same prices. Ships on the 21st" and then summoned the Foo Fighters, saving everyone a great deal of time and effort. I blame the internet. Apple keynotes were never perfect - there were, and are, always far too many pretty slides with numbers to sit through before the real meat of the event - but thanks to the internet rumour factory there's no reward for sitting through the boring bits any more. When you know every single detail, the effect is rather like sitting through one of those bum-numbing Powerpoint presentations where you've read every bullet point but the presenter's still reading each one out verbatim in a really slow and annoying voice. The problem is that no matter how secretive Apple tries to be, people are very, very interested in what it's up to: some newspapers were even suggesting that the iPhone 5 could boost the US economy. That means that anyone with a juicy Apple leak gets a lot of traffic, which translates via the power of advertising into big piles of money, and wherever there's money to be made you'll find people willing to bend rules and take risks to get a share of it. It's inevitable and ironic - products such as the always-connected, camera-packing iPhone make it exceptionally easy to snap and send a quick pic of something you shouldn't - and I think it's sad too: it's like going to a gig knowing not just what songs they'll play in what order, but what the singer will say between songs and what shirt the bassist will be wearing, or settling down to the first episode of Breaking Bad with a list of everything that happens to Walt and Jesse in all five series. I'm sure that for some people such knowledge enhances the experience, but for me it takes all the fun out of it: I liked seeing Steve Jobs smirk and pause for dramatic effect, safe in the knowledge that nobody in the audience had the faintest idea of what he was about to show them. Are we better off? In some ways, yes: I've certainly bought Apple kit in the past just before Apple updated it; these days you'd have to try very hard not to know when there's a new iPhone coming out. But the price we pay is that we're better informed but less entertained, more knowledgeable but less excited. The world's short enough of magic. It's a shame to lose a little bit more.